When it comes to seeking out great food, most people think major cities. But the smallest cities have attracted accomplished chefs and innovative restaurateurs that impress even the most sophisticated of foodies. As chain restaurants demolish their way across the landscape, we see fewer and fewer of these homegrown eateries; but they do still exist. From gas station dining to white tablecloth dining, dig into this list of Forsyth, Gerogia's Top 5 Restaurants. Grits Café is a neighborhood gathering place for hundreds of locals, and a destination restaurant for many travelers passing Forsyth along the I-75. Grits Café’s “Creative Southern Cuisine” focuses on traditional southern food, not exactly like Mom used to make, adding creativity and imagination by fusing old and new preparations. Many menu items spotlight local produce, beef, chicken, seafood and cheeses, a movement which Grits Café has embraced whole heartedly. The flavors are trendy and unique, and closely rival the artistic detail paid to the presentation of each plate. The wine list showcases the international wine stage, and features a number of handcrafted boutique wines produced in limited quantities, and many not readily available in other areas of the state or country. The Anvil Room is Forsyth, Georgia’s hometown pub and grill that specializes in great food and good fun! Located in a former foundry and blacksmith shop behind the popular Jonah’s on Johnston pizza restaurant in Forsyth, The Anvil Room serves up some of the finest burgers, sandwiches and hotdogs on their special recipe homemade buns. 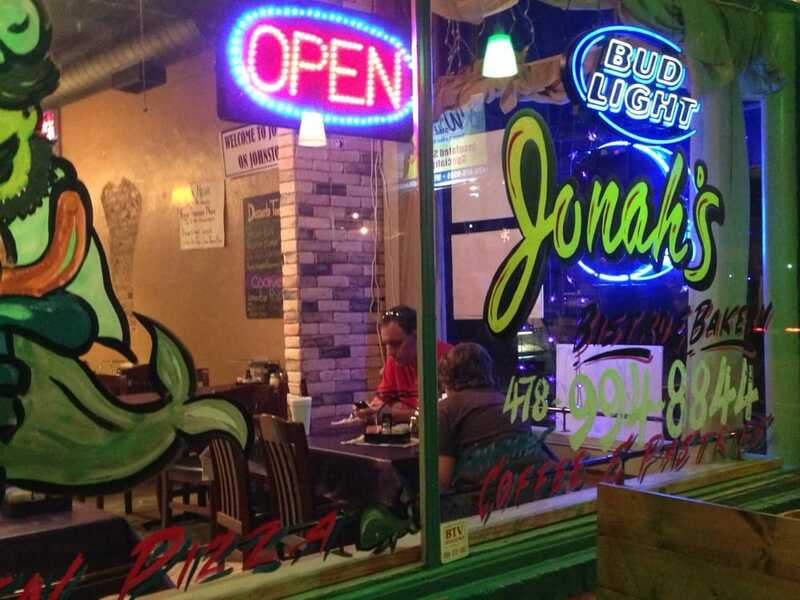 Jonah’s on Johnson is Forsyth’s hometown brick oven bistro that has pizza-lovers dishing out cream of the crop reviews. This pizzeria also operates a bar, so a round of drinks with dinner is not out of the question. With its kid-friendly vibe, this pizzeria is a great spot for families to chow down. From salads and sandwiches to pizza and calzones, grab a bite and dine in or sit out on their gorgeous patio. Don’t let the fact that this restaurant is attached to a gas station fool you. The Lucky Café has been voted Monroe County’s best Philly Cheesesteak sandwich 7 years in a row. The food is made fresh, right in front of you and while the location is not glamorous, the food is hard to beat. Be sure to introduce yourself to owners Sam & Karen, who make it their business to know all of their customers and are some of the nicest people you will ever meet. At El Tegado, you can dine on authentic Mexican food every day. El Tegado’s Mexican dishes are made daily with the freshest ingredients. Recharge and stop in on your lunch hour and enjoy one of their daily lunch specials. Whether you eat in or carry out, you’ll find the perfect combination of authentic Mexican dishes, appetizers, soups, and salads. While you're there, stop by the bar and enjoy one of the best margaritas in town!